Can someone please tell me how August got here so quickly? It seems like summer just got started, and now the days are getting shorter, mornings are cooler, and Halloween is just around the corner. 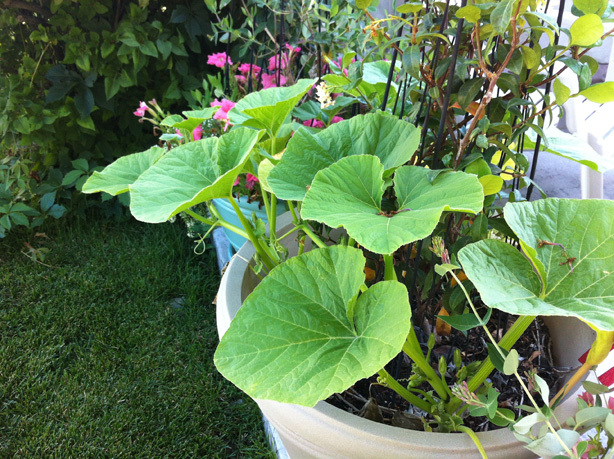 This year we planted pumpkins, and I even planted some in my pot. They are “lumina”, or white pumpkins. They are actually growing better and bigger than the pumpkins that I planted at the right time in the ground. I hope that we will get some pumpkins this year, but I am worried because we are just now getting flowers. That’s pretty late in the season. Other people already have actual pumpkins. This happened to us last year too; our pumpkins got a late start and had to be brought in the house green to avoid the frost. They did ripen inside in time for Thanksgiving, but they missed Halloween. Even though I am sad to see summer heading out, I have been enjoying the cooler mornings. It makes spending time in the garden so much nicer. The cooler mornings have meant a lot of time doing much needed weeding too. I’m still not really ready to let go of summer just yet though.